Beatrice Regina della Scala (1331 – 18 June 1384) was Lady of Milan by marriage to Bernabò Visconti, Lord of Milan, and politically active as the adviser of her spouse. Beatrice Regina was born in Verona in 1331, the youngest child and only daughter of Mastino II della Scala and Taddea da Carrara. She had three older brothers, and five illegitimate half-siblings. Her father, who was a member of the Scaliger family of Northern Italy, was Lord of Verona, Vicenza, Brescia, Parma, and Lucca. Her paternal grandparents were Alboino I della Scala and Beatrice, daughter of Gilberto III da Correggio of Parma, and her maternal grandparents were Jacopo I da Carrara and Anna Gradenigo, daughter of Pietro Gradenigo, Doge of Venice and Tommasina Morosini. On 27 September 1350 in Verona, Beatrice Regina was married to Bernabò Visconti, son of Stefano Visconti and Valentina Doria. She was nineteen years of age and he was twenty-seven. The marriage welded a powerful political alliance between Milan and Verona. He assumed power as Lord of Milan in 1354, henceforth, Beatrice Regina was styled as Lady of Milan. It has been claimed that Bernabò was a cruel and ruthless despot, and an implacable enemy of the Church. He seized the papal city of Bologna, rejected the Pope and his authority, confiscated ecclesiastical property, and forbade any of his subjects to have any dealings with the Curia. He was excommunicated as a heretic in 1363 by Pope Urban V, who preached crusade against him. When Bernabò was in one of his frequent rages, only Beatrice Regina was able to approach him. She reportedly had a strong will, and her influence upon Bernabò - and thereby upon the policy of Milan - was recognized: Catherine of Siena used her as an intermediary every time she had a political request to Bernabò. Beatrice Regina died on 18 June 1384 at the age of fifty-three years. She was buried in Milan. A year and a half later, her husband was deposed and later poisoned by his nephew and son-in-law Gian Galeazzo Visconti, who in 1395 became the first Duke of Milan. She gave her name to the church of Santa Maria alla Scala in Milan, and by extension, the La Scala opera house (Teatro alla Scala) which was built on the same site four hundred years later. 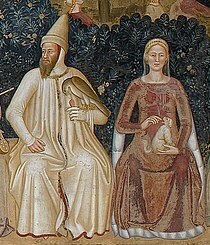 Ludovico Visconti (1358–7 March 1404), married Violante Visconti, widow of Lionel of Antwerp. They had a son, Giovanni, who left descendants. Giammastino Visconti (1370- 19 June 1405), married Cleofa della Scala (died 1403), by whom he had three children. She was the daughter of Cangrande II. Lucia Visconti (1372- 14 April 1424), married Edmund Holland, 4th Earl of Kent, the marriage was childless. Elisabetta Visconti (1374- 2 February 1432), married on 26 January 1395 Ernest, Duke of Bavaria, by whom she had five children including Albert III, Duke of Bavaria. The noble family of the Scaliger were Lords of Verona. Cansignorio della Scala was Lord of Verona from 1359 until 1375, initially together with his brother Paolo Alboino. Cangrande II della Scala was Lord of Verona from 1351 until his death. Luchino Dal Verme was an Italian condottiero.